Mashua is a perennial plant which is cultivated in order to obtain their edible tuber. This root vegetable is a major food source in the Andes regions. 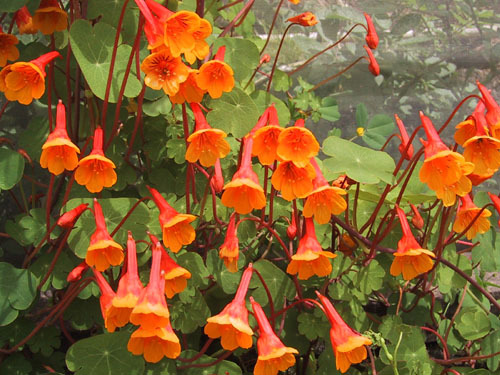 These plants belong to the Tropaeolum genus and are related to garden nasturtiums but they should not be confused with plants from the Nasturtium genus. The scientific name for this species is Tropaeolum tuberosum. The history of these edible plants goes as far back as the pre-Inca periods. Numbers of pre-Incan pictograms representing Mashua along with potato, ulluco and oca bear evidence of the importance of this tuber crop. The date for the domestication of these plants can be dated back to 5500 B.C. These climbing plants are a great favorite with many gardeners as they have a rather attractive appearance besides being very useful. Size: Their height ranges between 0.5 and 1 meter while growing somewhere between 1 and 2 meter in diameter. They have cylindrical and slender aerial stem. Foliage: Mashua plants have bluish green foliage with alternate, round and peltate leaves. Each leaf consists of 3-5 lobes. Flowers: The flowers of these plants may vary from dark yellow and orange to scarlet. Roots: The tubers or rhizomes are usually pale white or yellow sometimes striped with purple or red. Some varieties may have red or purple roots. These plants mainly grow in Andes Mountain. Their distribution range includes Peru, Bolivia, Ecuador, Venezuela and Columbia. Mashua is being cultivated in New Zealand and the Pacific Northwest to decide whether they can be cultivated in places other than the Andes. It is very easy to grow these perennial plants as they can survive in many types of soils. However, they should be grown beside a wall as they need proper support to grow. 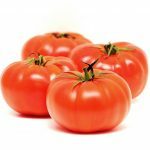 They can resist various insects, bacterial pests, fungi and nematodes. Due to this reason, they are often cultivated as a companion crop for potatoes and maize in places like Peru and Columbia. The bulbs or tubers are planted in a bright and warm location during spring after all risks of frost have passed. One can also grow Mashua plants indoors in pots or containers. Soil: They can grow in almost any type of garden soil as long as it is moist. Sunlight: These plants grow well in direct sunlight. Climate: Dry climates are ideal for their proper growth. Water: They need ample amounts of water during summer; however, one should lessen watering the plants as winter arrives. Elevation: These plants are generally cultivated in the Andean highlands at heights between 2600 meters and 4000 meters. In mild winter regions, the tubers can be left in ground to be harvested when required after applying a layer of mulch to the soil. 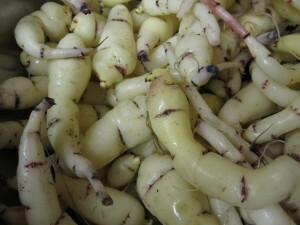 However, they should be harvested and stored like other tubers in extremely cold temperatures. Harvesting is done simply by digging out the roots of these edible plants. This tuber crop has antibiotic and diuretic properties. It is believed to be able to cure skin ulcers and also to kill lice. This tuber crop has high nutritional value with almost 80 per cent carbohydrate and 14-16 per cent protein. !00 gm of these roots contains approximately 480 mg Vitamin C and 9 µg ß-carotene. The roots are usually not consumed raw as they have a somewhat unpleasant peppery flavor like that of a radish. 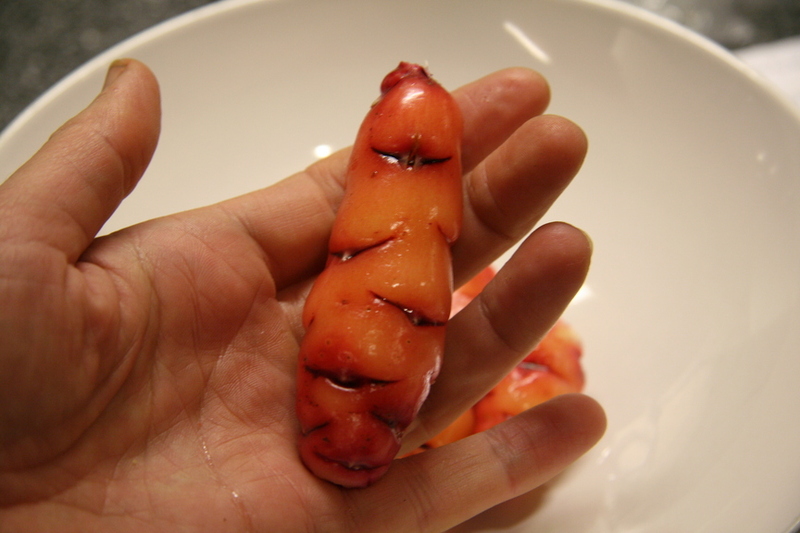 However, cooked Mashua tubers are a principal food source in the Andean regions of South America. The flowers, leaves and flower buds are also edible. These plants are also a traditional Andean folk medicine having been used for numerous medicinal purposes by humans for a long period of time. This root vegetable is used in soups, stews and other dishes. One can also fry or bake these tubers in order to consume them. Baked tubers have a beautiful aromatic flavor along with a mushy texture that resembles sweet potatoes. Mashua tubers are soaked in molasses to prepare desserts. Young leaves of these edible plants are eaten as green vegetable. Their fresh flowers are eaten in salads. The flower buds are consumed when pickled in vinegar. These tubers are also used to treat nephropathy (damage or disease of kidney). 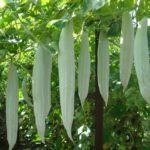 Sometimes, they are used in the treatment of skin ulcers. Peasants in many South American countries feed their pigs with these rhizomes or bulbs. These plants are recommended for livestock feed as the roots contains high levels of carbohydrates while their foliage is rich in protein. One should avoid eating this root vegetable during pregnancy as it may cause some complications. The tubers can be boiled, roasted or fried in order to be consumed. 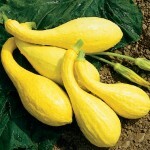 They can be boiled like a root vegetable along with meat and other vegetables to make soups and stews. It is important to wash the roots before using them for edible purposes. The flowers of these plants are consumed raw after being washed properly. The young leaves of Mashua can be cooked like leafy vegetables. These tubers are not known to cause any adverse health effects; however some people believe that consuming these tubers causes infertility. Here are some interesting facts about this root vegetable. These tubers are an important food source for more than 9 million people living in the Andes Mountain at elevations between 2500 meters and 4000 meters. It is ranked fourth after potatoes among the most important root crops of Andean regions. According to Spanish chronicler Cobo, Inca emperors fed their armies with this tuber, “that they should forget their wives”. This root vegetable is generally not available in the United States. 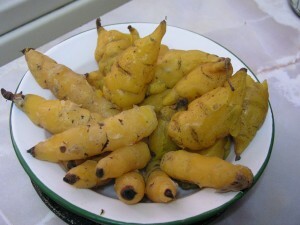 However one can grow these plants in their homes in order to obtain these tubers. Here are some images of these plants and their tubers. Researchers are trying to find out whether Mashua can be cultivated in regions other than the Andes Mountains. 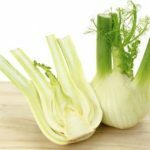 This beneficial root crop might be an answer for the ever increasing food requirements of the growing population all over the world.